The electric car is not a technology of the future, but from the past. The electric car is 170 years old. This may sound surprising, but e-cars predate automobiles with a combustion engine. They were driven out of the market in the beginning of the 20th century because petrol engines had significantly better mileage. One century later, the electric car still faces the same – fundamental – problems. Furthermore, the need for batteries makes them eco-unfriendly by nature. The only possible green future for electric cars is a wired future: hooked up to the overhead lines, like trolleybuses and bumper cars. "Like electric cars, the environmental score of a trolleybus depends on the way the electricity was generated. However, a trolleybus does not face the problem of energy storage." Car manufacturers want us to believe that the automobile will soon become a completely harmless technology, comparable to a bicycle or a pair of roller skates - because the car of the near future will run on electricity. Hybrid cars – which combine an electromotor with a combustion engine – are already a hype and fully electric cars are not far behind. Unfortunately, most electricity is produced by means of fossil fuels. That means electric cars will not lower traffic emissions, apart from doing so in the statistics: the air pollution and the CO2 that are now attributed to road traffic, will then be filed under energy production. A power plant has a higher efficiency than a car’s engine, and an electric motor has a higher efficiency than a combustion engine. Herein lies a potential advantage for the environment, even if the electricity needed to power electric cars is generated by fossil fuels. And let’s be optimistic for once and assume that we will have a 100 percent green electricity infrastructure in 10 or 20 years time (let’s call that hugely optimistic, since it’s already an enormous challenge to green the existing infrastructure and a massive introduction of electric cars means we have to build many more power plants). So, then, we have green cars, right? Alas, no. The electric car has a serious environmental drawback compared to a car running on a combustion engine: the battery. The ‘fuel tank’ of an electric car consists of hundreds of connected batteries, each of them comparable to the battery of a mobile phone (the Tesla Roadster, an electric sports car, has more than 6,000 of them). After some years, they all have to be replaced, and already before that time there is a reduction in storage capacity. The environmental profit gained by a higher efficiency (or by green electricity) will be negated completely by the massive amount of batteries required. Batteries have to be manufactured, and that process is very energy-intensive and environmentally harmful. Batteries also have to be discarded or recycled - both processes again require extra energy and inflict environmental harm. Batteries are the flaw of electric cars, and not only when considering the environment. Electric cars are not yet a reality because of the limited mileage of their ‘fuel tanks’. At best, an electric car can drive 100 miles. After that, the car has to be plugged in for hours. There are several possible ways to get around that. We could set up a system where a driver can swap batteries at a fuel station, or even a system where a driver could swap cars. It may sound surprising, but the first electric car was invented around 1835, half a century earlier than the first gasoline powered car. In the late 19th and early 20th century electric cars were more popular than gasoline (and steam) powered cars (see this overview of early electrics). 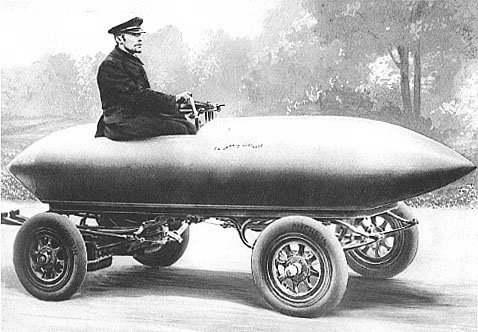 In 1899, an electric car was the first to break the speed barrier of 100 km/h (62 mph). The “Jamais Contente” (picture above), as it was called, weighed 1,500 kilograms and the two batteries made up half of that weight. In 1916, the first hybrid car was invented, equipped with both an internal combustion engine and an electric motor. The Toyota Prius is nothing new. The explanation for the success of the electric car was the fact that it did not require a manual effort to start the engine, and that gear changes were not required. 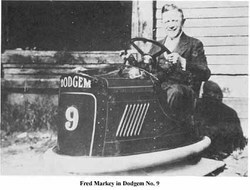 Gasoline powered cars needed the use of a hand crank to start, and the need to shift gears made driving more difficult. Moreover, since most driving was done over short distances in town, as elsewhere there were no good roads, the limited mileage was not a problem. The expansion of the road network, however, and the invention of the starter motor for gasoline cars, made an end to the success of the electric car. Around 1930, it disappeared almost completely. It resurged only in the sixties and seventies, when environmental concerns arose. However, only the electric passenger car disappeared. Around the same time that the popularity of the electric car started to decline, networks of trolleybuses appeared in cities around the world. A trolleybus has an electric motor, but it needs no battery since it gets its electricity from the overhead cables – like an electric train or a tram (streetcar). It is cheaper than a tram because there is no need for rails. It is also slightly more flexible – a badly parked car will not stop it. Trolleybus lines were built all around the world, and in 360 cities they are still operating today. 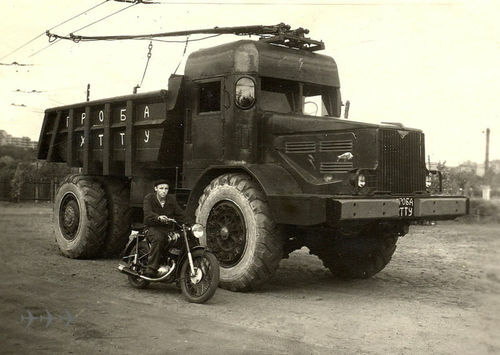 Although much less widespread than trolleybuses, trolleytrucks were used too (especially in Russia). 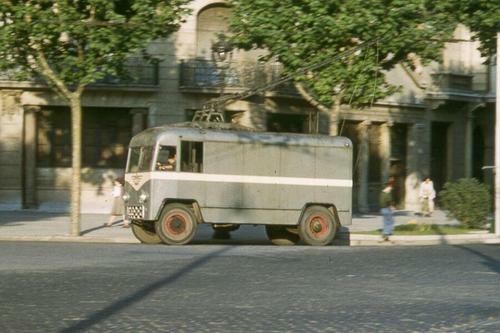 They made use of the existing trolleybus infrastructure (like this van in Barcelona, picture below) or they used a specially built infrastructure (like the line in Ukraine, picture above). In most countries, trolleybuses disappeared in the fifties and the sixties to make way for the diesel bus, which was cheaper (and more flexible). The technology, however, is very noteworthy. Like electric cars, the environmental score of a trolleybus depends on the way the electricity was generated. However, a trolleybus (just like a tram or an electric train) does not face the problem of energy storage. Therefore, the problem with the electric car is not that it’s electric, but that it’s wireless. Would it be possible to design wired electric passenger cars? The only wired passenger cars that exist today are the bumper cars on the fun fair. Technically, it’s perfectly possible to build a similar widespread network for wired passenger cars, based on the technology of bumper cars or trolleybuses. There is no new high-tech needed for that. In fact, the basic concept of bumper cars was originally designed as a method of transporting goods and people. However, it would mean overhead lines or grids as far as you can see, if we would want to keep the absolute freedom of movement of the passenger car. Such a system would be easier to apply on highways, but that would mean that all cars have to maintain the same speed and that they are not able to pass one another – unless the grid system of bumper cars is copied. Either way, such systems raise the question why we do not use trams or trains instead. The technological problems that electric cars have faced for more than a century now, compared to the smooth operation of electric trains, trams, trolleybuses and bumper cars, may mean that the wireless electric car simply has no future. Its problem might not be technological, but conceptual. Certainly, better batteries will improve the mileage and the charging time of electric cars, but it’s hard to see how they can do that without harming the environment. While the sole reason for the existence of electric cars today is that they are better for the environment. © Kris De Decker (edited by Vincent Grosjean) / the original title of the article was "Bumper cars on the highway"
Subscribe via email or feed. Follow us on Twitter or Facebook.